There's no shortage of places to show off your costume on Halloween, but sometimes a space really speaks to what you're getting after. 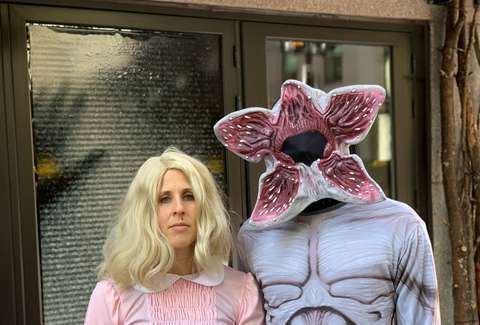 For anyone styling themselves as a Demogorgon, Eleven, or Chief Jim Hopper, the Precinct Kitchen + Bar at Loews Boston Hotel might be too good to pass up. Precinct is turning itself into Hawkins, Indiana for Halloween with a Stranger Things pop-up bar that runs from October 26 through November 17. You won't have to crawl through any disgusting holes in the wall to get to the bar, but there is plenty of iconic imagery from the show to make you feel like the Mind Flayer is lurking just around the corner from the dimension in which you are drinking. You can sit under Joyce Byers' alphabet wall or take a photo on an '80s bike. 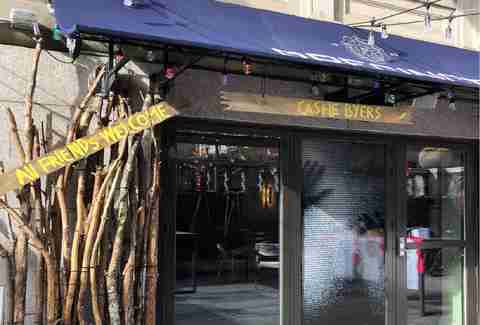 The front door is styled to look like Will's Castle Byers, and the menu is even on-theme. You can grub like 11's sliders, which features deep-fried chicken on waffles with maple bourbon butter. It's not quite like eating a dusty waffle off a box in the woods, but it's close. The cocktail menu is also themed for your pleasure, including a "Justice for Barb" souvenir cup that comes with the cocktail of the same name. Additionally, the bar will host an '80s dance party every Friday and Saturday night, as well as the night of Halloween. They won't be serving Short's Brewing Company's Chief Hopper DIPA, but this is still better than being asked to dog-sit Dart.